Cornelius Gerling in the Monaco office of Edmiston & Company reports a considerable price cut for Mondomarine's 40.64m Streamline. 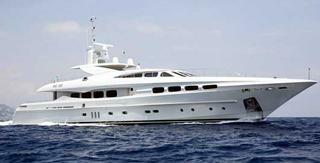 Built in 2007 to RINA class, she accommodates 10 guests in five cabins and cruises at 17 knots. Previously priced at €11.45 million, the new asking price is €9.45 million and Streamline is available for inspection in Savona, Italy.